Viswanathan Anand was the undisputed World Champion from 2007-2013 and is one of the greatest talents the game has ever known. The “Tiger of Madras” grew up in a chess backwater, but could hardly go unnoticed. He would win classical six-hour chess games using only minutes on his clock, and became India’s first grandmaster as an 18-year-old. He soon went on to take his rightful place among the world chess elite, winning countless tournaments and rivaled only by Kasparov as the best blitz and rapid player on the planet. His road to the World Championship proved longer and more winding. The first great chance came in 1995, when he played a match against Garry Kasparov at the top of the World Trade Centre in New York. After eight draws in a row Anand won Game 9, but then collapsed to lose four of the next five, a psychological blow that he admitted weighed on him in his future encounters with Kasparov. Anand won the FIDE Knockout World Championship in 2000 but was first considered the undisputed World Champion by most chess fans in 2007/8, when he proved his dominance first in a tournament and then in a match against Vladimir Kramnik. His old Achilles’ heel of slightly superficial opening preparation wa‌‌‌s a thing of the past. He went on to defend the title against Veselin Topalov in 2010 (winning the final game) and Boris Gelfand in 2012 (winning a rapid play-off). Despite retaining the title Anand went on to suffer something of a crisis, struggling to win games in many tournaments until an upswing in early 2013 that culminated in victory at the Grenke Che‌‌ss Classic in Baden-Baden. Later that year he finally played a World Championship match in his home city of Chennai (formerly Madras), India, but his 22-year-old opponent Magnus Carlsen was the clear favourite after dominating the chess world for the previous three years. Indian hopes were boosted by a positive start, but losses in Games 5 and 6 saw Anand slip to a 6.5:3.5 defeat. Was that the end of the World Championship story for a great champion? No! 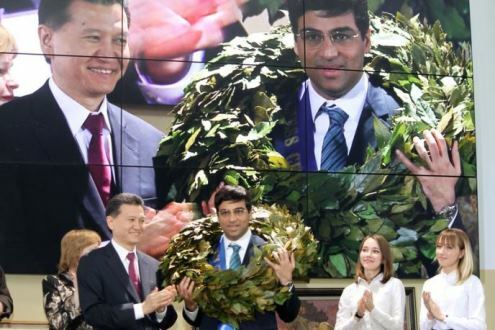 Just when most pundits had written him off Vishy was back to his imperious best at the 2014 Candidates Tournament in Khanty-Mansiysk. He dominated from start to finish and won the event with a round to spare. That meant he got to take on Magnus Carlsen in a new match in November 2014. It was no repeat of Chennai, as after winning an early game Anand kept within touching distance of Carlsen until the penultimate game. Alas, just when he seemed to have chances of pulling off a victory that would level the score before the final game he overpressed and lost. The final score was Carlsen 6.5:4.5 Anand. At the post-game press conference the former World Champion immediately replied "no" to a question about whether he would now retire, drawing a loud round of applause from the audience. Learn to play chess with a World Champion: The video series that formed the basis of the above course - also completely free! He has caliber...Good luck Anand..!! What ever be your age V. Anand sir..we would keep supporting you..please dont retire! !hopeing the for you Sir..May God Bless You..
Time to update and add World Rapid Chess Champion 2017! Second or third best after Magnus. Maybe he COULD surpass Magnus if he was cute and smiled a lot, and be in the Top 3 players. Vishy Anand's calculation Can be compared to Garry Kasparov and Bobby Fischer. All 3 of them need no introduction. Anand should never retire. be like Kortchonoi. Play chess till 70-75 years of age!!!!!!!!!!!!!!!!!!!!!!!!!!!!!!!!!!!!!!!!!!!!!!!!!!!!!!!!!!!!!!!!!!!!!!!!!!!!!!!!! He is a legend. He is amazing. I wish to be like him.